The following article appeared in The Sun, a now defunct New York newspaper, on September 3, 1912. This paper discontinued publication in 1916. FIRST WOMAN FLIES IN R. I.
Providence, R. I., Sept. 2 – Lincoln Beachey was the principal performer this afternoon at an aviation meet held at Narragansett Park over the old racetrack. Beachey in a biplane performed stunts never before witnesses in this state. Miss Ruth Bancroft Law, the first woman to fly in Rhode Island, went up in a biplane and for ten minutes entertained the 100,000 spectators. It was Miss Law’s first flight alone. Samuel A. Libbey made a triple parachute jump from a balloon, landing about two miles from the park. The meet was held by the Rhode Island Aviation Association and Beachey’s performances included spiral glides and maneuvers in the air the brought the crowd to its feet. He dropped several chalk bombs. Of the forty minutes of actual flying at the meet Beachey was in the air a half hour. 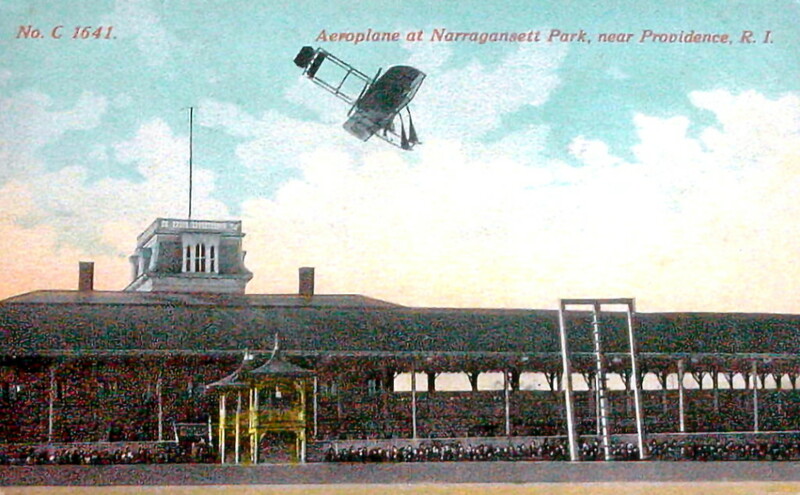 Post Card View Of The Former Narragansett Park in R.I.
Ruth Bancroft Law was a famous aviator of whom much has been written, and can be found elsewhere on the Internet.